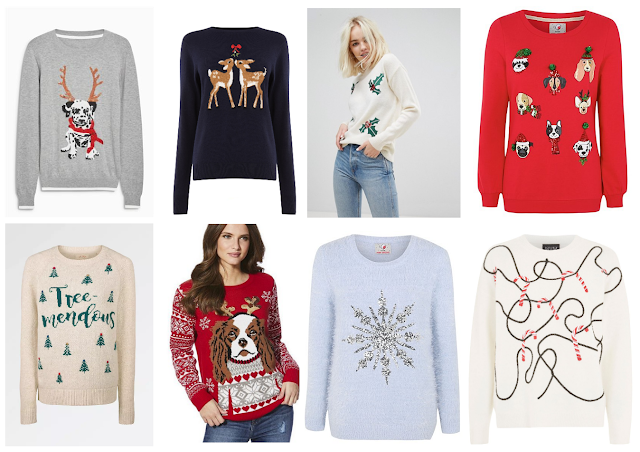 I have a nice collection of Christmas jumpers and even though the Christmas season isn't that long, I feel like I could do with a couple more Christmas jumpers in my collection. It's a bit like bikinis. You buy them for your holidays, but then when else are you going to wear them? I'm like that with Christmas jumpers. Today, I'm sharing my favourites with you... I'm going to get one. But which one should I get? So first of all let's talk about the amount of dog Christmas jumpers there are this year? I think it's brilliant! Personally because I love dogs and I think they're cute. I'd kinda like that I have one like this already after turning my John Lewis Buster the Boxer jumper into a reindeer dog! (Check out that DIY from last year here!) I really enjoy the Next and Asd ones for all their cuteness... probably the Next one more but I do like the spaniel one from Tesco because there is a Men's matching one with a boxer dog (and one for your kids and dogs too if applicable). As well as those, I really enjoy a pun and the simpler Christmas jumpers. The tree-mendous one made me giggle lots and I really love the reindeers under the mistletoe for it's cuteness. Maybe one for a Christmas themed date night! The other ones are just lovely simple jumpers that are very Christmassy but not the in-your-face way... if you know what I mean. I enjoy the simple signs of Christmas: a snowflake, holly and candy canes. This year I'm a little disappointed that my local Primark barely have any Christmas jumpers. And the ones they have are your bog-standard ones that you probably already have. I bought my favourite one from Primark so I think I expected more from them. Anyway - that's my Christmas jumper wishlist for this year. Which Christmas jumpers have you bought this year and which one do you think I should get?